Cecil McDonald, Jr. Ms. Greta, 2013. Archival pigment print. 30 x 40 inches. Courtesy of the artist. william cordova, balsa, 2008. Rephotographed photo of “Machu Picchu” by Martin Chambi (1929), Victor Jara’s “Canto Libre” LP (1973), and Herbie Hancock’s “Thrust” LP (1974) on custom Bolivian balsa wood shelf. Courtesy of the artist and Artpace, San Antonio. University Galleries of Illinois State University is pleased to announce the opening of two new exhibitions on August 16. william cordova: kuntur: sacred geometries and Cecil McDonald, Jr.: In the Company of Black will be on view through October 14, 2018. All events at University Galleries are free and open to the public. kuntur: sacred geometries presents new and recent works by artist, writer, curator, and educator william cordova. Born in Lima, Peru, and now based in Miami, Lima, and New York, the artist engages with time, displacement, and the histories of places and objects. He cites his particular interest in “reframing history and making the invisible visible” as he interweaves evocative materials—such as gold leaf, feathers, Peruvian cacao, and paint chips reclaimed from a famous 1970s graffiti mural— into richly layered works. 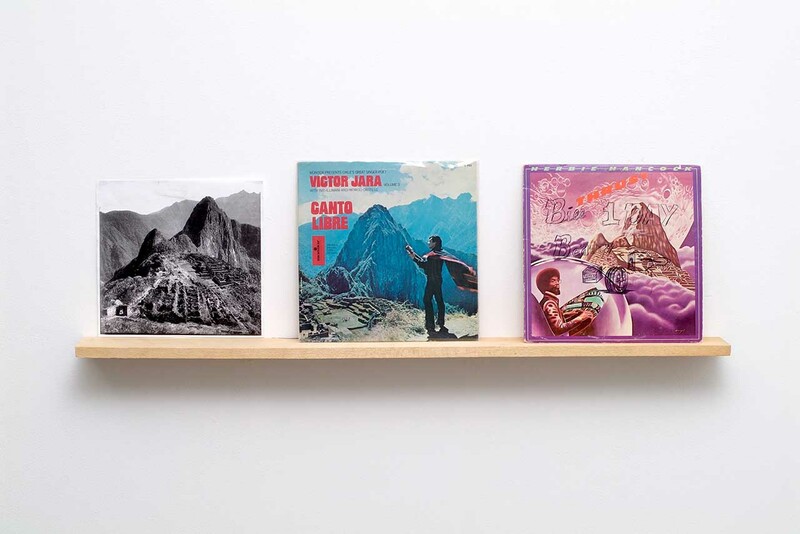 cordova describes this exhibition as a “synthesis of Andean and Western architecture, sacred geometries, and historical narratives.” Combining research, travel, writing, drawing, photography, and film, he creates an installation inspired, in part, by the Kuntur (The Condor) constellation. Kuntur was one of the Incan Empire’s “dark constellations,” found in areas of darkness within the Milky Way Galaxy. As the artist points out, “constellations give form to imaginary outlines shared by different cultures at different times and geographical locations.” The exhibition and programming are designed to connect cultures and build a stronger sense of community. Read more. william cordova: kuntur: sacred geometries is sponsored by the Harold K. Sage Foundation and the Illinois State University Foundation Fund, and a Town of Normal Harmon Arts grant. Programs at University Galleries are sponsored in part by a grant from the Illinois Arts Council Agency. The fall 2018 schedule of exhibition and events and additional information is available on the University Galleries website. Free parking is available in the deck directly above University Galleries after 5:01 p.m. Please contact gallery@ilstu.edu or 309-438-5487 if you need to arrange an accommodation to participate in any events related to these exhibitions.